Cúcuta ([ˈku.ku.ta]), officially San José de Cúcuta, is a Colombian city, capital of Norte de Santander department. It is located in the northeast of the country, in the eastern branch of the Colombian Andes, on the border with Venezuela. Cúcuta has a population of approximately 650,000 people according to the 2005-2020 census, making it the 6th largest city in the country. Due to its proximity with Venezuela, Cúcuta is an important commercial center. The international border in Cúcuta is said to be the most dynamic of South America. The city has a length of 12 kilometres (7.5 miles) from north to south and 11 kilometres (6.8 miles) from east to west. It is divided into 10 communes and it is the political, economic, administrative, industrial, cultural and tourism hub of the Norte de Santander department. Cúcuta has experienced a great urban development, as a result other cities has been constituted around the city, like Los Patios in the east, and Villa del Rosario in the south. They are part of the Metropolitan Area of Cúcuta which has a population of about 850.000 people. It is connected by roads across the country to major cities like Bogotá, Bucaramanga, Ocaña, Valledupar, Pamplona, Tunja and Cartagena de Indias and because of its location, to many cities of Venezuela. Its airport, Aeropuerto Internacional Camilo Daza, offers flights to several Colombian cities as well as to Panama City. 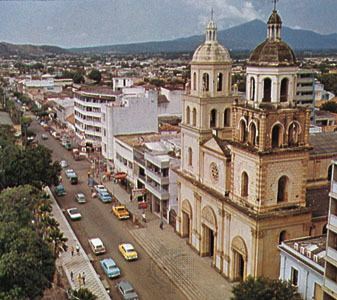 The city of Cúcuta was called San José de Guasimales from 1733 to 1793, the year in which the name changed to San José de Cúcuta—"San José" (Saint Joseph) is for the Virgin Mary's husband, and "Cúcuta" means "The House of Goblins" in the language of the Barí indigenous group. In the city's seal, a legend states, Muy Noble, Valerosa y Leal Villa de San José de Cúcuta ("Very Noble, Valiant and Loyal Town of San José of Cúcuta"). The city has the nicknames "City Without Borders", "Gem of the North," and "City Forest.". The constant hostility of the Motilones indigenous group towards the whites who lived in the valley, and their economic ambitions, were key factors in the request for the erection of a parish with the name "San José". Juana Rangel de Cuéllar donated 782 hectares (1,930 acres) on June 17, 1783 for the construction of a church and land for Spanish families. Today this area is the neighbourhood of San Luis. The metropolitan area, which includes the municipalities of Villa del Rosario, Los Patios, El Zulia, San Cayetano and Puerto Santander, has a combined population of more than 830,000 people. It is the largest metropolitan area in eastern Colombia and sixth in Colombia, behind Barranquilla and Cartagena. James Rodriguez, 25-year-old footballer who plays for Real Madrid in Spain. Marino Vargas Villalta, civic leader and businessman, founder of the first local shoe store and factory. During the fifties and sixties, he was also the president of the popular and successful local football team, the Cúcuta Deportivo. The city is governed by the three branches of power, the ejecutive power; the major and its departments, the legislative power; the city counsil and the judicial power, which is formed by the tribunals and many other organisms of control. The mayor is elected for a 4-year period and is in charge of electing each head of the administration departments. The city counsil is formed by 19 representatives elected by popular vote for four years. They approve or reject each decret issued by the Mayor and make or correct laws regarding the city. Its Free Zone is the most active of all those in the country and one of the most active in all Latin America, largely due to Venezuela being Colombia's second largest trade partner. The Colombian peso is the official currency. However, because of its proximity to Venezuela, the bolivar is accepted by the vast majority of commercial establishments. Six overpasses are under construction. The sport that gather people the most is football, although basketball, volleyball, and Inline speed skating are also popular. The Cúcuta Deportivo -recently relegated to the Second Division- is the main professional team of the city, and play their local matches at the General Santander stadium. The team won their first Championship in the 2006 season and had a well remmebered participation in the 2007 Copa Libertadores, when they reached the semifinal and lose to the multichampion Boca Juniors; since that year, no other Colombian team has reached the semifinal of the prestigious competition. Other professional teams located in the city are the Norte de Santander(Basquetaball team), and futsal team Cucuta Niza; Both squads play local at the Coliseo Toto Hernández.